OFCEAS was discovered by the University Joseph Fourier, Grenoble, France, who developped and patented the spectroscopic advantages of feeding back the laser signal into itself, enabling mode locking of the hyperreflective cavity (gas cell) and the laser source. The use of a resonating cavity – a multipath gas cell using hyper-reflective mirrors – enables path length up to 50 km (Fig. 1). Internal volume of the gas cell is ca. 20 mL, enabling T90 (time required to achieve carry-over efficiency of 90%) of a few seconds, depending of gas sample flow rate. The feedback phenomenon increases the purity of the laser source. 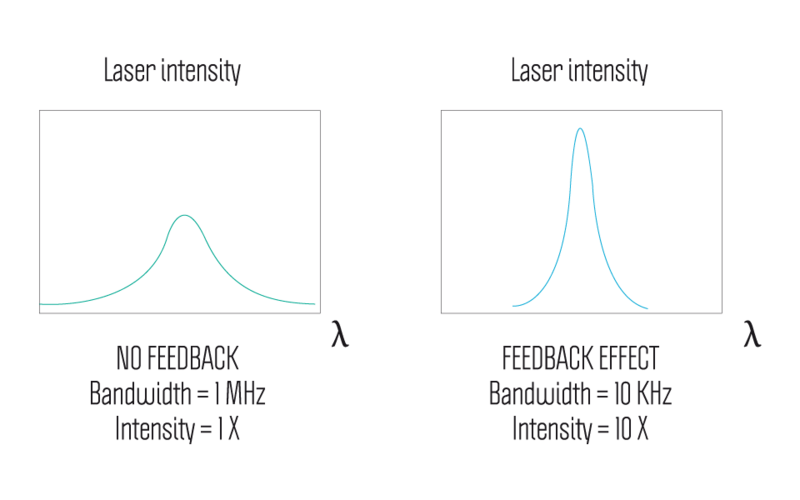 It was experimentally demonstrated that the bandwidth of a standard continuous DFB laser is reduced from 1 MHz to 10 KHz. 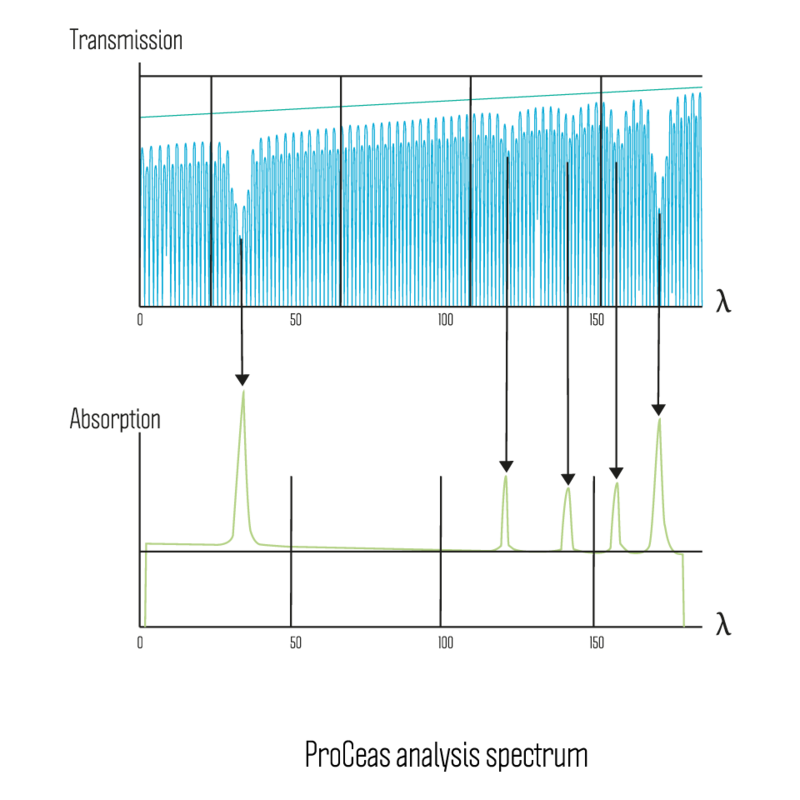 As the Lavoisier’s Law of Energy Conservation applies in this case, all energy that was originally distributed over a 1MHz bandwidth is now concentrated in a beam of only 10 KHz of bandwidth. The net result is an increase of 10X in signal intensity (Fig. 2). Elimination of most of the laser beam noise (i.e. energy radiated at wavelengths different from the target emission wavelength) translates into measured single scan (100 milliseconds) noise levels only 4.10-10 Absorbance Units. Lastly, the increase of purity of the laser beam injected in the cavity yields a measured instrumental response linearity of 4 orders of magnitude for direct intensity measurements. The use of the hyper-reflective cavity is initially meant to increase path length (and therefore sensitivity) to the kilometric scale. OFCEAS relies on direct intensity measurement rather than the estimate of a ring-down time. A varying current is applied to the temperature controlled laser source, enabling the tuning of the laser to the frequencies of resonance modes of the cavity. This technique enables the collection of 200 intensity data points distributed in an equidistant manner in the wavelength domain in 100 milliseconds (Fig. 3). When using a ca. 1500 nm DFB laser, the spectrum collected is characterized by a true optical resolution of 0.00112 nm (ca. 0.005 cm-1). 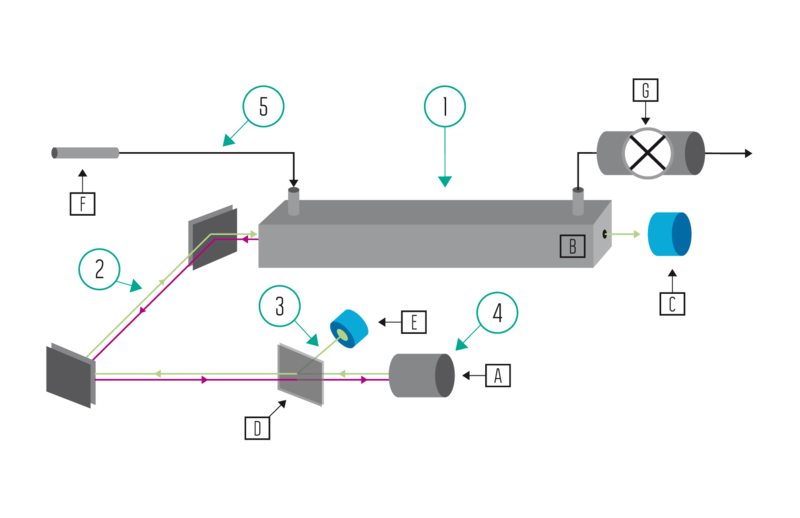 Self-stabilization of the spectrometer is a direct consequence of the laser feedback and subsequent mode-locking phenomenon. The modes (resonance frequencies) of the hyper-reflective cavity are distributed – in a typical configuration of the device – every 152.272 MHz. 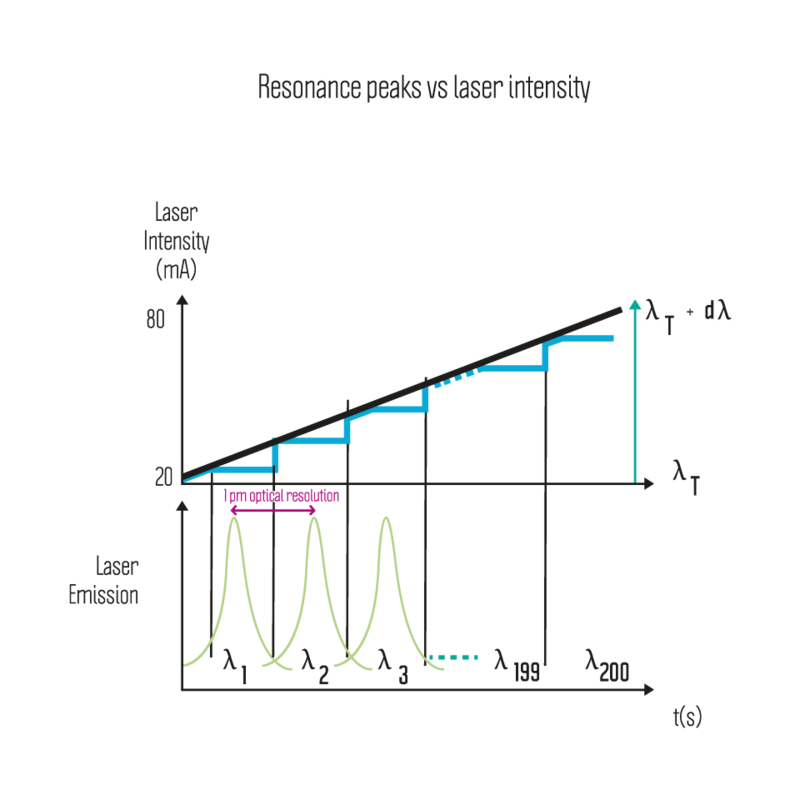 As current applied to the DFB laser is increased and the laser emission frequency increases proportionally, the feedback of the laser from the cavity enables early lock on to and late release from of the laser emission frequency to the cavity mode (Fig. 4), hence stabilizing the signal over approximately 500 microseconds (self-stabilization of the source to the mode of the cavity). Self-standardization – the property of OFCEAS enabling the device to operate from very long periods of time without re-calibration or even re-zero – is enabled by technological means such as the inclusion of a self-referencing photodiode, measurement of a cavity ring down time every 100 milliseconds after the collection of a full direct intensity spectrum, and use of a piezoelectric motor controlled return mirror for real-time phase synchronization of the source and feedback signals. AP2E analyzers are available with either one or two laser cavities. Each cavity can be fitted with one or two lasers. Each laser can measure multiple gases depending on absorption intensity / proximity and matrix. The number of laser cavities and lasers per cavity is determined by the application and the molecules of interest. 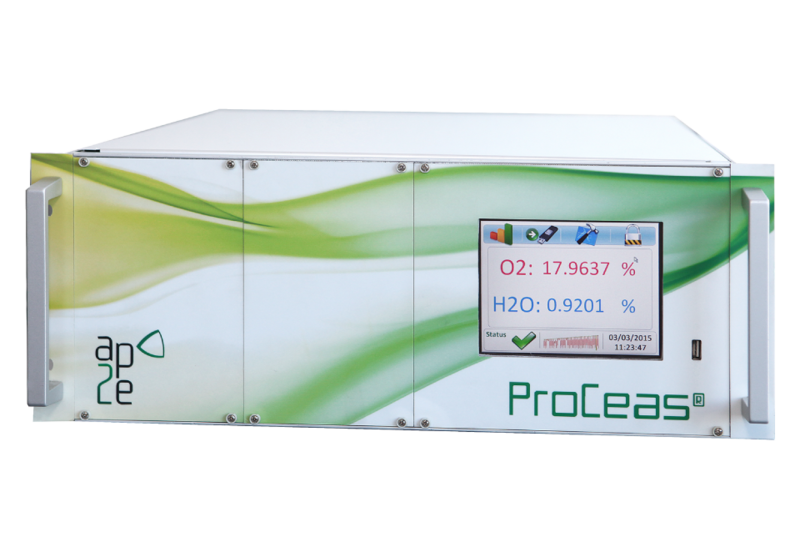 As an example, up to 10 different gases can be measured in 1 x 19” rack analyzer.